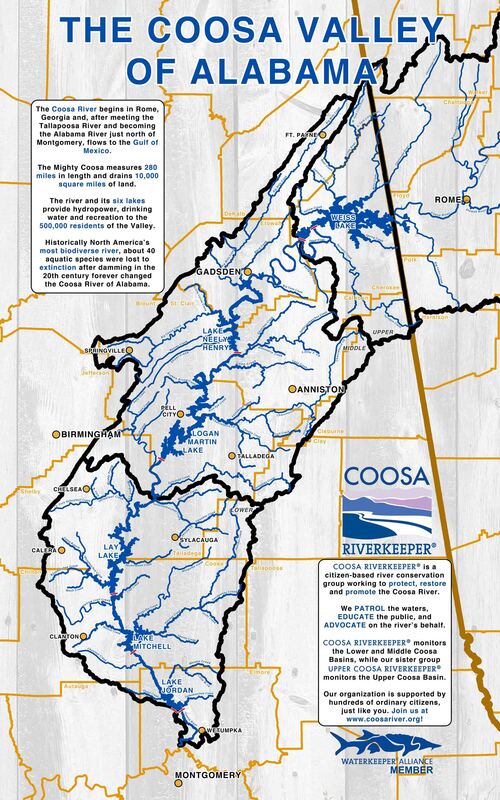 Today Coosa Riverkeeper releases two new maps which present a new look on a river that’s flowed through Alabama since before maps were even a thing! First, our new “Coosa Valley of Alabama” map updates our basin-wide map of the Coosa, it’s six main lakes, and many important tributaries. Now you can enjoy learning the names of many of the Coosa’s important creeks! 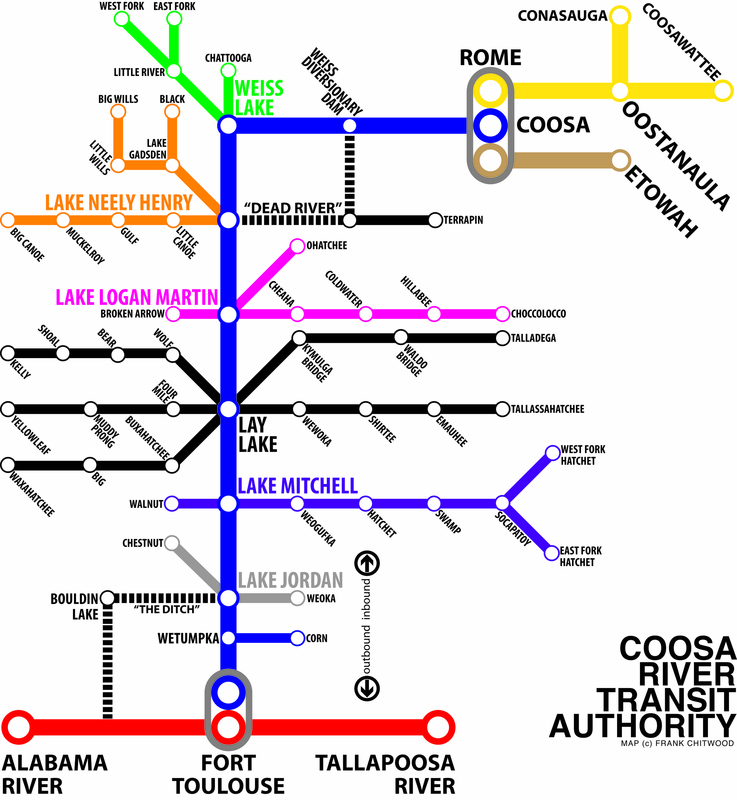 Secondly, the “Coosa River Transit System” map presents a non-conventional way of viewing our river system as though it were a subway system. Maps are far more than an educational tool or a conversation starter, they are an insight into the way we view the world around us. What we choose to display on a map, and just as importantly-what we choose to leave off, says a lot about the way we see ourselves within our environment. Alabama’s rivers feature prominently on any map of our great state, and are even the central figure of the Great Seal of the State of Alabama. Our “Coosa Valley of Alabama” map shows some of the larger cities in the watershed as well as the names of our six large lakes and the names of the most significant creeks. We use this map, which we display at events with a four foot tall print-out, to help people find their Coosa Connection and put a geographical pin to the places we work so passionately to protect. This map is a fairly standard projection of our watershed, generated by former Director Dr. Miriam Hill from JSU, with labels added by our staff Riverkeeper. The “Coosa River Transit System” map on the other hand is an endeavor designed to present a new way of looking at the Coosa. According to the map’s creator, our Riverkeeper Frank Chitwood, “The primary purpose of this map is to illustrate the disconnected state of the Coosa River. Due to an almost complete impoundment of the Coosa in Alabama with eight Alabama Power dams, the Coosa’s six lakes are each detached from one another in many ways. Though water flows from one lake to the next as the river descends from the highlands towards the Gulf, neither fish nor man can cross these large structures.” As such, each lake and it’s associated tributary creeks are displayed on this map as though they were their own line on a subway system, each connected only by the Blue Coosa River Line.